BeXtreme is a Spanish brand created in January 2013. Born in Barcelona from a group of Riders tired of paying exorbitant prices to get good boards of extreme sports. At BeXtreme, we take care of getting the best boards on the market thanks to our Riders team, which tests all the tables before putting them on sale. We demonstrate that you can have high quality snowboard, wakeboard, skateboard and longboard, eco-friendly, and with the latest technology at affordable prices for all. Our MISSION is to offer the customer quality equipment, with warranty and tested at the lowest possible price. Our ETHICS is simple, treat each customer individually to get the board you really need and at a good price. We manufacture a functional product of quality. We work with innovative and environmentally friendly components and materials that are different from traditional brands. We get better results and better driving experiences. We all know that boards are made of wood, resins and chemical fibers that damage the environment. At BeXtreme, we manufacture biodegradable tables that do not cause negative environmental impact and that use wood with a certificate of replantation (FSC) or plant substitutes such as bamboo and paulonia. Our resins are made from recycled biomass and natural basaltic lava fibers. More about ECO materials. Our main way of advertising is cooperation with other companies, to be as environmentally friendly. For any collaboration, do not hesitate to contact us. You can see our cooperation and events. If we still have not convinced you, here are 8 reasons to choose our snowboards, skateboard or longboard. How we create our boards? Our snowboards, skateboards, longboards and wakeboards are made one by one by hand. This does not mean that our manufacturers use machines and molds to speed up production and minimize costs, but you can be sure that your board has been treated individually. 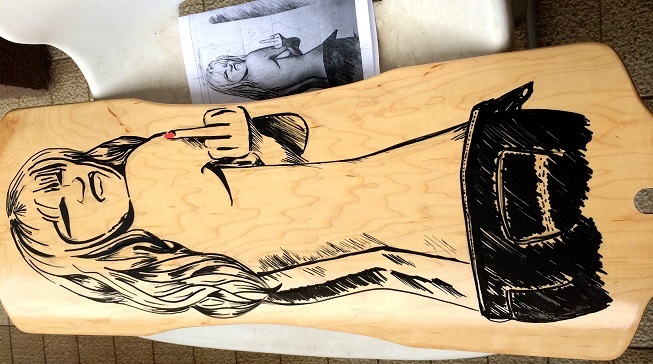 If you are looking for a handmade longboard Blood 36 is what you need. In addition to offering you the best products at the best prices, we have sent you a space where you can be able to find all the relevant information and news related to extreme sports. You will find all its information on our Facebook. If you want to see extreme videos, you snowboard or longboard, both with our boards and our riders, here is our YouTube channel to which you can subscribe. You can also see pictures of our surf, skateboard and longboard on our Instagram.